Mike Babcock must be feeling the heat. With his club in the midst of a 3-7-0 slide and Atlantic Division rivals Boston and Montreal nipping at its heels, Toronto’s head coach is warming up to an idea he once refused to entertain. Based on Monday’s practice, Auston Matthews and Mitch Marner will face the Washington Capitals on Wednesday…as members of the same line. Yes, the Leafs’ two best forwards will finally join forces at even strength. They’ve likely been waiting just as long as their fans have to discover the full potential of this partnership. Given Babcock’s stance in previous years, it’s a surprising move that speaks to a new level of desperation that may be setting in. He clearly doesn’t want Matthews and Marner together, but he can no longer afford to stay the course and let the chips fall where they may. After two straight first-round exits and the monumental signing of John Tavares, standards are higher now. 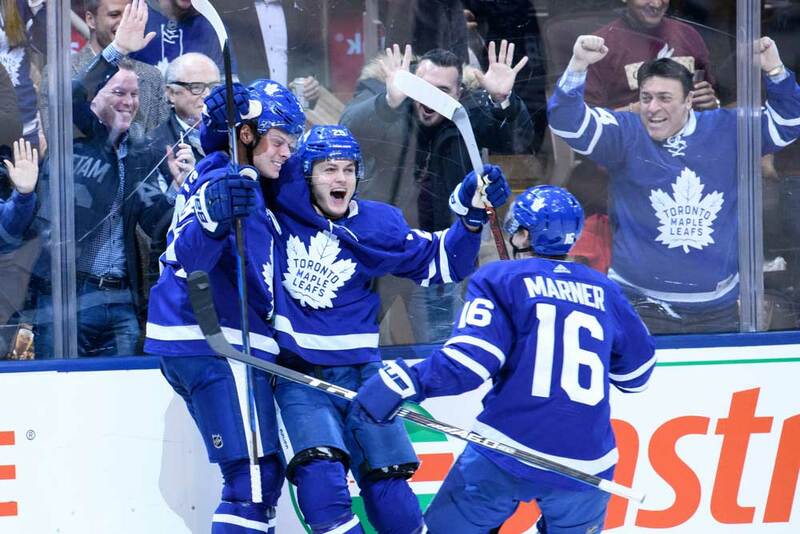 The Leafs are expected to advance deep into the postseason and contend for a championship. As it stands, the team looks completely lost. It’s scored 24 goals during this 10-game slump, and that 2.40 goals-per-game tally pales in comparison to the 3.79 it averaged over the 38 contests preceding this dry spell. In essence, the offense needs a lift in a hurry. If there’s one player on the team who can provide that shot in the arm, it’s Marner (61 points in 48 games). The 21-year-old winger has been the most dangerous Leafs player since the 2018-19 campaign kicked off, pairing his uncanny vision with soft hands and a relentless motor. It’s safe to say Tyler Bozak was holding the kid back, as his production and impact have soared to new heights with Tavares as his center. He now plays with supreme confidence in the face of stiff competition. Sure, he still commits the occasional eye-popping turnover, but which star player doesn’t? He’s a chance-generating machine who appears to be thriving with more responsibility. He’s even faring well as a regular member of the penalty-killing rotation. Granted, he remains much better with the puck than without it. When he’s in possession, all eyes are on him — and that attention extends to the other team. As he darts around the offensive zone, stopping, starting and spinning on a dime in hopes of creating a passing lane, opponents are left entirely flustered. They can’t help but puck-watch while the spectacle unfolds. Through his production and consistency, he’s shattered all doubts about his game and cemented a place among the very finest playmakers in the world. On the flip side, Matthews (42 points in 34 games) is mired in the worst goal-scoring slump of his career and looks less engaged than he ever has as a three-zone player (-9 through 9 games in January). He isn’t winning one-on-one battles or uncorking his otherworldly wrister. Any time he does have the puck, he’s swiveling back and forth in the offensive zone, waiting for a linemate to offer him something. Anything. It seldom happens. William Nylander (4 points in 20 games) is out of sorts since returning from his holdout. With all due respect to Zach Hyman (18 points in 38 games) and Connor Brown (16 points in 48 games), they don’t belong on a line with Matthews either. They don’t process the game quickly or handle the puck effectively in tight areas, which stifles much of the threat that the center presents. There’s no questioning his gifts, but defending a single player isn’t difficult — especially since Toronto’s reliance on the stretch pass rarely affords Matthews possession in high-percentage areas. When he does retrieve pucks, he’s already below the goal line. As such, his options boil down to either initiating a cycle or passing to a defenseman for a prayer from the point. While that scenario is perfectly acceptable for a grinder, it feels like a total waste of Matthews’ abilities. His best fit this season has been with Kasperi Kapanen (30 points in 48 games) because the winger generates so much speed through the neutral zone (50.9 SCF%, 61.5 GF%). He’s also a capable scorer and competent passer. For whatever reason, though, Babcock won’t leave them together. That may be a blessing in disguise. Marner isn’t quite as fast as Kapanen, but he’s smarter, shiftier and a more potent offensive weapon. He’s also struck a better balance between looking to score and looking to set up teammates this season (0.40 GPG vs. 0.27 GPG in 2017-18). You can’t sag off him in coverage because he’ll actually pull the trigger now. Marner’s presence will command opponents’ respect and at least somewhat dissipate the crowd of defenders swarming Matthews at every turn. Ultimately, the reason many have been clamoring for this pairing is Matthews’ ceiling. Even with his stellar start in the NHL (174 points in 178 games), you get the sense that he’s barely scratched the surface. He can simply do things that Tavares cannot on the strength of his build, reach, hands, skating and cannon of a shot. Since entering the league in 2016-17, the 6’3”, 223-pound pivot ranks second in goals per game behind Alex Ovechkin. He also slots in second behind Connor McDavid in even-strength goals despite having played 34 fewer games. Keep in mind that he’s been forced to produce with at least one subpar linemate throughout his entire career. This season, he’s become a one-man show on many nights: His team-leading 87.1 individual points percentage reveals that he has carried his line. When he isn’t directly involved, pretty much nothing positive happens. Since Patrick Marleau (22 points in 48 games) will round out Matthews’ trio on Wednesday, that dead-weight pattern lives on. But Marner is talented enough to power a unit on his own too. Matthews has never played with this type of talent for an extended stretch, and the same can be said for Marner. They’re already elite at their respective disciplines. Together, they could be generational. It would be downright foolish for the Leafs not to explore this possibility. Depth is great, but the upside here is so much greater. To be fair, perfect lines on paper don’t always pan out on the ice. After all, there isn’t necessarily rhyme or reason to hockey chemistry. With that said, Matthews and Marner did run roughshod over Montreal in the span of one period last year. Believe it or not, veteran enforcer Matt Martin was the left winger on that line. For one fleeting moment, Toronto’s premier talents were unleashed on an unsuspecting opponent. Depending on your perspective, it was either glorious or cruel. By that same token, this precedent shows that Babcock may not consider Matthews and Marner a preferred long-term partnership. Despite spectacular results (61.8 SCF%, 80.0 GF%) in limited minutes together in 2017-18, they would always return to their full-time lines shortly thereafter. In the end, Babcock could simply be trying to jump-start his offense before reverting to the same old story. That would be a real shame. If they’re afforded the time to build a rapport and iron out the kinks, this duo could set the world on fire.